​Welcome back students!!! In our last lesson of the course, besides learning new ballet technique, we are also going to see a story that appeals to many people! 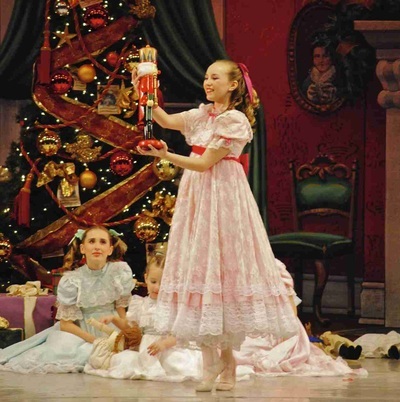 Set during Christmas time, The Nutcracker has become a Holiday favorite. Are you ready? Let’s begin! PIQUÉ: Pricked, pricking. Executed by stepping directly on the point or demi-pointe (half-point) of the working foot in any desired direction or position with the other foot raised in the air. PIROUETTE: Whirl or spin. A complete turn of the body on one foot, on point or demi-pointe. Correct body placement is essential in all kinds of pirouettes: The body must be well centered over the supporting leg with the back held strongly and the hips and shoulders aligned. The force of momentum is furnished by the arms, which remain immobile during the turn. The head is the last to move as the body turns away from the spectator and the first to arrive as the body comes around to the spectator, with the eyes focused at a definite point which must be at eye level. This use of the eyes while turning is called "spotting." POISSON: A position of the body in which the legs are crossed in the fifth position and held tightly together with the back arched. This pose is taken while jumping into the air or in double work when the female dancer is supported in a poisson position by her partner. PROMENADE: Turn in a walk. Used to indicate that the dancer turns slowly in place on one foot by a series of slight movements of the heel to the required side while maintaining a definite pose. RELEVÉ: Raised. A raising of the body on the points or demi-pointes. Opposite movement of PLIÉ. ROND DE JAMBE: Round of the leg, that is, a circular movement of the leg. SAUTÉ: Jumped, jumping. When this term is added to the name of a step, the movement is performed while jumping. SISSONNE: It is a jump from both feet onto one foot (with some exceptions in which the jump ends in both feet). Sissonne may be performed petite (small) or grande (big). TOURNANT: Turning. Indicates that the body is to turn while executing a given step. TOUR EN L’AIR: lt is a turn in the air in which the dancer rises straight into the air from a demi-plié, makes a complete turn and lands in the fifth position with the feet reversed. The turn may be single, double or triple according to the ability of the dancer. The arms assist and the head must spot. ​With this new terms, we complete our Ballet course!! Now go on and practice!! The genius Tchaikovsky, among other things, composed three well recognized ballets: Sleeping Beauty, Swan Lake (which we studied in Lesson 2), and the one we are about to learn: The Nutcracker. The Nutcracker is a ballet that is produced everywhere in the world by Christmas time, it is simply a classic of Christmas Holidays! But how did this story come to be? Well everything started with a book written by E.T.A. Hoffman called The Nutcracker and the Mouse King, which later was adapted by French writer Alexandre Dumas to the Nutcracker story we know and love nowadays. ​So with Alexandre Dumas adaptation, The Nutcracker ballet came to be! It premiered at the Mariinsky Theatre in St. Petersburg, Russia, on December 18, 1892. It is a two act ballet, originally choreographed by Marius Petipa and Lev Ivanov, and composed by Tchaikovsky. At that time, the music was a success, but unfortunately the story and production wasn’t, however, nowadays The Nutcracker enjoys tremendous popularity and the story is revived every year by countless ballet companies during Christmas time! It’s a classic favorite and here’s the story! The story starts on Christmas Eve, where Clara’s family and friends gather to decorate the Christmas tree. Once everything is set, the party starts, and things get better when Drosselmeyer, a magician and Clara’s godfather, brings with him four lifelike dolls that dance. When the dolls are sent away for safekeeping, another surprise comes in the form of a nutcracker toy. Clara instantly likes it, but Fritz, one of her friends, breaks it, causing Clara to feel sad and heart broken. During the night, Clara returns to check on the nutcracker, and when the clock strikes midnight, mice start to fill the room and the nutcracker grows to human size. Soon, a battle between gingerbread soldiers and mice, led by their king, starts. Tin soldiers also join the fight, and when the Mouse King is about to attack the Nutcracker, Clara throws her slipper at him, giving the Nutcracker enough time to stab the Mouse King. With the Mouse King defeated, the mice retreat and the Nutcracker transforms into a Prince. 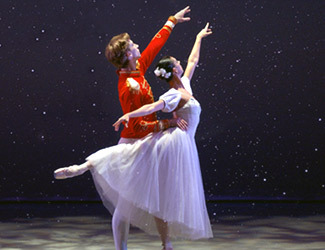 The Prince leads Clara to a pine forest, where snowflakes dance under the moonlight as the first act ends. Clara and the Prince travel to the Land of Sweets, the Prince’s Kingdom. In the meantime it had been ruled by the Sugar Plum Fairy, until the Prince returns. After the Prince retells how Clara had helped him return to his own self, a celebration of sweets to honor Clara the heroine begins. Sweets from all over the world perform, including: Chocolate (Spanish Dance), Coffee (Arabian Dance), Tea (Chinese Dance), Candy Canes (Russian Dance), also we get to see the Dance of the Reed Flutes, Mother Ginger and the Polichinelles, the Waltz of the Flowers, and Sugar Plum Fairy and her Cavalier dance. When the dancing ends, it’s time for Clara and the Prince to return home. In a reindeer sleigh that takes off, Clara and the Prince wave goodbye. Now please enjoy the following videos that represent some most importan Waltzes from the ballet: Dance of the Sugar Plum Fairy, The Waltz of the Snowflakes, and the Waltz of the Flowers. Eager to know more about The Nutcracker? Here are some fun facts! ​1. The impact of this ballet is such that it is estimated that Major American ballet companies generate around 40 percent of their annual ticket revenues from performances of The Nutcracker. 2. 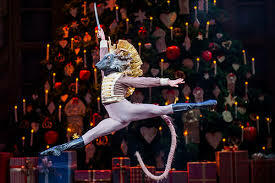 The original story, Hoffman’s “The Nutcracker and the Mouse King”, is much darker than the ballet, featuring a bloody battle between the Nutcracker and the Mouse King’s army. Another important difference between these is that Hoffman’s tale contains a long flashback story that explains how the Prince was turned into the Nutcracker, and this explanation had to be eliminated for the ballet. 3. When The Nutcracker was first performed in 1892, critics were not impressed. It wasn’t until George Balanchine’s production of the ballet in 1954 that the show began to gain popularity, and by the late 1960s, The Nutcracker established itself as the essential ballet of the holiday season. 4. At the first performance of The Nutcracker, the roles of Clara and the Nutcracker Prince were played by children. In later professional productions, these roles were given to adult dancers. 5. Although Tchaikovsky’s score for The Nutcracker is one of the best known pieces of his music, he did not feel it was his best work. He actually liked more his score for Sleeping Beauty! 6. Tchaikovsky died less than a year after the original production of The Nutcracker. 7. The uniquely twinkling instrument you hear in “The Dance of the Sugar Plum Fairy” is a celesta. Tchaikovsky smuggled this instrument into Russia from Paris to add a unique sound to accompany the character of the Sugar Plum Fairy.